Regards to all our listeners! I'm Rob Logan, Ph.D., senior staff, U.S. National Library of Medicine (NLM). Here is what's new this week in To Your Health, a consumer health oriented podcast from NLM, that helps you use MedlinePlus to follow up on weekly topics. A salute to NLM's deputy director and former acting director who retires during this summer's solstice after 44 years of stellar assistance to health information professionals and the public. Betsy Humphreys' remarkable career included significant contributions to NLM's Unified Medical Language System (UMLS), ClinicalTrials.gov, and health literacy as well as leadership that touched many of the Library's diverse activities. When NLM began planning health informatics services in the 1970s and 1980s, Betsy Humphreys worked as part of a team to develop the UMLS, the ultimate medical thesaurus. Today, UMLS enables health providers, patients, and all of us to conduct comprehensive searches on MedlinePlus.gov, PubMed, clinicaltrials.gov, as well as other NLM public facing services. For example, UMLS provides the undergirding that makes it possible to access all information on 'neoplasms' and related medical terms when we type 'cancer' in MedlinePlus.gov's search engine (or vice versa). Similarly, after creating a foundation that supports NLM's internet based health information services, Betsy worked with international researchers to develop interoperable medical vocabulary standards that are used in health information websites around the world. Indeed, the creation of increased 'semantic interoperability' to enable better health information services is a touchstone of Betsy's career. Betsy Humphreys also is one of NLM's authorities on the creation of interoperable information technology standards to improve the sharing of health information between health care institutions, government agencies, and consumers. More recently, Betsy helped oversee the writing of standards and rules of the road for all contributors (such as teams of clinical trial researchers) who provide the information that is the backbone of Clinicaltrials.gov. The combination of the provided standards with the website's features now enable users to obtain detailed information about completed and in-process clinical trials, including the names of sponsors, and anticipated clinical outcomes. 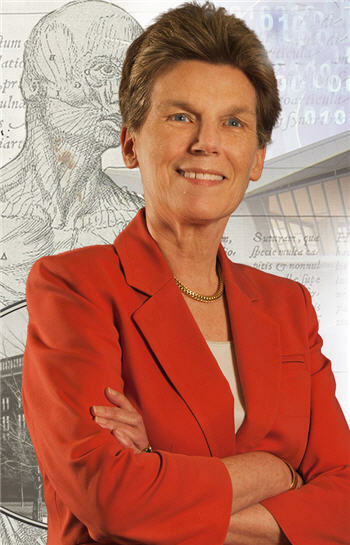 Betsy also is one of the founding members of the National Academies of Sciences, Engineering, and Medicine's Roundtable on Health Literacy, which has helped researchers and practitioners improve the public's understanding of health and medicine since its inception in 2004. I was fortunate to occasionally substitute for her at the health literacy roundtable, which helped me better understand how improving health literacy is linked to better health outcomes and addressing some of the structural and social determinants of health. Francis Collins M.D., NIH's director, recently told an NLM audience that Betsy's tenure as NLM's acting director (from April 2015 to September 2016) was distinguished by gracious leadership and a consistent ability to provide advice and counsel to her NIH peers. Patricia Flatley Brennan Ph.D., NLM's director, also warmly praised Betsy's efforts to set higher standards both for NLM, NIH, as well as the medical informatics field. In her farewell remarks, Betsy repeated two favorite quotations that inspired her decisions and career. Quoting a former NLM official, Betsy said: 'The future is longer than the past' (end of quote). She explained the latter means good leaders need to pay more attention to anticipate the future impacts of their actions than trying to correct what has occurred previously. Betsy also summarized her approach to making career choices when she told about 200 NLM colleagues and friends (and we quote): 'If you do not work on important problems, it is unlikely you will do important work' (end of quote). Appropriately, Betsy's work has been recognized as seminal by national organizations such as the Medical Library Association, and the American Medical Informatics Association. A dedicated continental and international hiker, we wish Betsy happy trails. We toast a leader who set so many standards of practice, leadership, tolerance, collegiality, and facility. Before I go, this reminder... MedlinePlus.gov is authoritative. It's free. We do not accept advertising .... and is written to help you. To find MedlinePlus.gov, just type 'MedlinePlus.gov' in any web browser, such as Firefox, Safari, Chrome, or Explorer on any platform. We encourage you to use MedlinePlus and please recommend it to your friends. MedlinePlus is available in English and Spanish. Some medical information is available in 48 other languages. A written transcript of recent podcasts is available by typing 'To your health' in the search box on MedlinePlus.gov's home page. The National Library of Medicine is one of 27 institutes and centers within the National Institutes of Health. The National Institutes of Health is part of the U.S. Department of Health and Human Services. A disclaimer — the information presented in this program should not replace the medical advice of your physician. You should not use this information to diagnose or treat any disease without first consulting with your physician or other health care provider. It was nice to be with you. Please join us here next week and here's to your health!